We're used to seeing electrical outlets along the walls, down near the floor. In kitchens and bathrooms you also find outlets on the walls just above the counter tops. The challenge is with open floor plans there are fewer walls, so fewer places to put outlets. This seems a bit crazy with all our new electronic toys (well, my laptop isn't a toy but maybe my iPad) that need to be plugged in to refuel them. Popular with open floor plans are kitchen islands because they provide lots of extra work space … but no extra wall space. That's where these new popup electrical outlets are giving homeowners more flexibility in how they power their kitchens! They're perfect as we're all becoming much more dependent on electronics, from our phones to new kitchen gadgets. You can get a tablet integrated into your refrigerator which is great for recipes but not really useful for homework … so let's explore what's happening. For years the electrical outlets on kitchen islands have been placed on the side of the island. Sadly these electrical outlets stick out (photo above) because the outlet plate is white or almond, against darker wood cabinets. That's why we came up with the “under the counter top” outlet strategy below. The electrical boxes aren't hidden inside the cabinets. 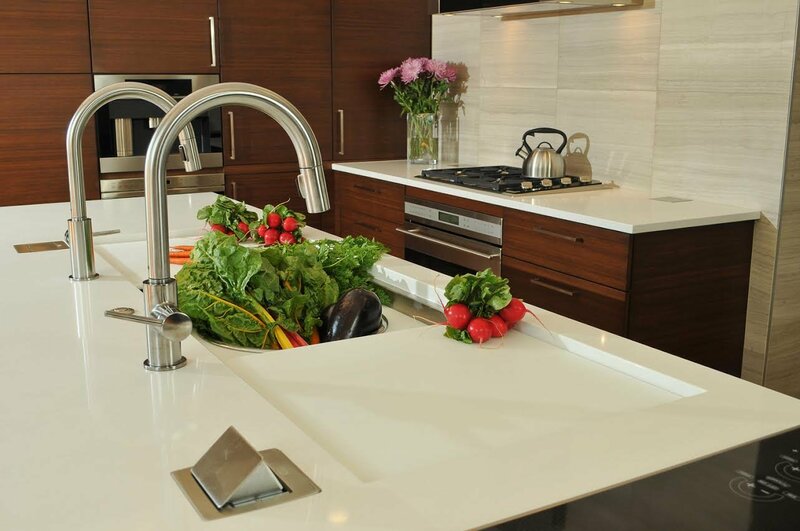 They're installed under the overhang of the counter top, making it easy to plug in phones, tablets and more. So here's a fun story for you because my family is full of nerds. You see I worked for IBM for 29 years so my husband, kids and many of my friends are also nerds. When we get together it's not unusual for there to be 2, 3 or more laptops on the dining room table or kitchen island. This technology focused family kitchen meant even before the advent of iPads and smart phones, we needed outlets on the kitchen island to avoid wires running on the ground from the opposite walls. And we knew we needed lots of outlets so we put them on both ends of the island which seats five people. Lots of outlets is all relative. Today with iPads and smart phones, I think lots of outlets would probably mean eight or more. We'll be selling this home soon (here's an article I wrote about staging a house) so I'm not to add more outlets here. I will though, carefully consider how many kitchen outlets I need in my new home … and add a few extra for the devices we can't imagine will be around even five years from now. And yes, I will use popup electrical outlets in my new home! At the Kitchen and Bath Industry Show (KBIS) we saw many different pop-up electrical outlets that are perfect for kitchen islands. These outlets come in many different sizes, finishes and designs. The magic is the outlets are in plain sight on top of the countertop. Most of the time they're closed, and almost invisible until you open them. Many of the new electrical outlets also have USB outlets in addition to the traditional 2 or 4 plug outlets. That's the perfect solution for families with lots of new devices that need power, like iPads for recipes and homework, checking the family schedule or watching a video while you prepare dinner. 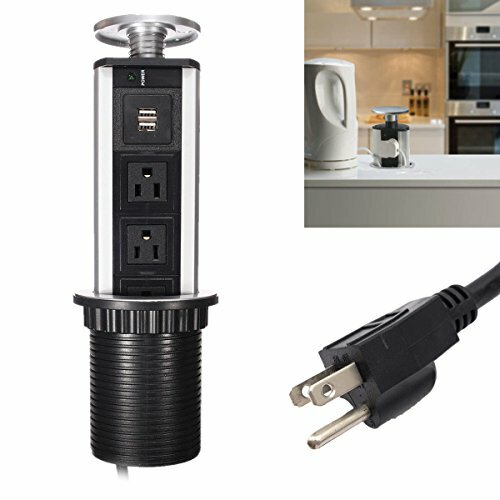 The cylindrical pop-up outlet above comes up vertically, and offers 2 outlets on either side, plus several USB outlets. The design addresses a problem with power strips where you sometimes can't use every outlet when the plugs are too big. It's also nice that when you don't need power, the vertical outlet sinks down into the kitchen island counter top (and cabinet below). When closed you only see a small chrome circle visible on top (see below). There are many more pop-up outlets to choose from, just like the many power strips we've had for years. 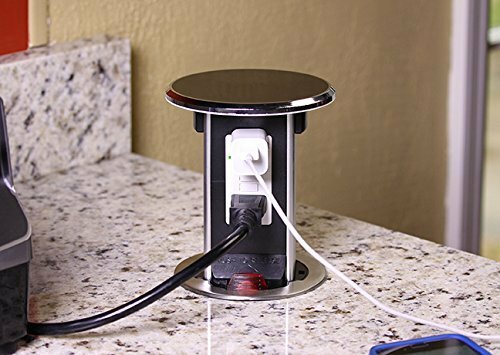 You can look at some of theses popup electrical outlets on Amazon, where you'll also see the boxes that need to be installed below the counter top or desktop in a home office. They come in different sizes, shapes and finishes (see the brass one below). Avoid tripping hazards from electrical wires laying on the floor or worse, stretched across open space. Designate one area of the kitchen for activities needing power, like homework, leaving your food prep space less cluttered. Create a charging station in one corner of the kitchen (family room, mud room or whatever space is most convenient for family members) using popup electrical outlets. Need more outlets in your kitchen? Question: Eddie asked “What kind of clearance is needed under the countertop for a pop-up outlet? Check with your local electrical inspector to make sure your popup outlet meets local electrical codes. Have a licensed electrical contractor install your new popup electrical outlet. In a kitchen or bathroom, the new outlet should be connected to a GFCI circuit breaker. Cut away the back panel when installing the outlet over a drawer. We've done this for years, with bathroom vanities, so we could use the space around the sink plumbing. Install outlet over shelving and hide the outlet with a false wall at the back of the cabinet (see below). With wider kitchen islands, leave space between the island cabinets for the island popup outlet. Lastly, what I've done for years is place the popup outlet underneath the overhang where it's visible but only when you poke your head below the countertop. What kind of clearance is needed under the counterspace for a pop-up outlet? For example, can I put a pop-up on top of a counter with a dishwasher under it? If I put a pop-up on top of a pull out drawer, does it limit the functionality of the drawer? Eddie, I started researching your question but there are so many different pop-up outlets and each needs a different clearance. I would however say you should not put an outlet above a dishwasher as water & electricity are a disaster waiting to happen. I’d look for a shorter outlet if you want one in an island (or you can put one underneath the overhang like I’ve done for years). Eddie, Yes the pop up outlet affect the functionality of cabinets with drawers. The drawers will not be able to close. If you go to LEW Electric, you can find the specs. They are a little bit bigger than a traditional electrical box. Stephanie, I don’t think the problem stated is as big as you suggest. People have been cutting drawer backs out for sink plumbing for years. I also looked more closely at an island pop up outlet I found in a model home recently. While I didn’t have a tape measure, I took photos of the cabinet below the outlet. My home features the traditional wall outlets. I wish we had the popup outlets like the ones featured in your article. It would make cooking so much easier for my husband and I. We do a lot of cooking and we also have a lot of appliances we use for our cooking. It’s always so frustrating when we have to move things around just to plug in the appliance.